The Pieridae are a lairge faimily o butterflees wi aboot 76 genera containin approximately 1,100 species, maistly frae tropical Africae an Asie. Maist pierid butterflees are white, yellae or orange in coloration, eften wi black spots. 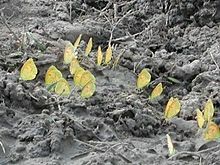 The pigments that gie the distinct colourin tae thir butterflees are derived frae waste products in the body an are a characteristic o this faimily. 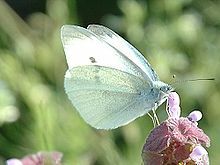 It is believed that the name "butterfly" oreeginated frae a member o this faimily — the Brimstone Gonepteryx rhamni — which wis cried the "butter-coloured fly" bi early Breetish naituralists. The sexes uisually differ, eften in the pattern or nummer o the black markins. The larvae (caterpillars) o a few o thir species, sic as Pieris brassicae an Pieris rapae, commonly seen in gardens, feed on brassicas, an are notorious agricultural pests. Males o mony species exhibit gregarious mud-puddlin behaviour when thay mey imbibe salts frae moist soils. ↑ 1.0 1.1 DeVries P. J. in Levin S.A. (ed) 2001 The Encyclopaedia of Biodiversity. Academic Press. Pteron In Japanese but binomial names 3 pages o images. Tip Next page. BHL Brigs Catalogue o the Papilionidae an Pieridae.